Oh, what we do for our sport! From getting up at 3am to go to a horse show to wearing a long-sleeve black jacket in 90+ degrees, and from slogging warm water buckets in below-freezing temperatures to cleaning stalls every day, we definitely put in some overtime to succeed with our horses. For some, being physically fit is yet another sacrifice but not for me; I enjoy exercise. It teaches me things about my body (such as which side is stronger, which side is more flexible, and which side has more balance) and I feel better on days when I can get in a workout. The three necessary components of any solid exercise program are aerobic fitness, muscular strength and endurance, and flexibility. Cardiovascular workouts and resistance training are stalwarts of my exercise program, as is yoga–which I’ve practiced for 30+ years–so all three components are covered. Yet I’m open-minded to other forms of fitness with the goal of making me both a healthier human as well as a more effective rider. So when my barn owner arranged for Janice Dulak (Pilates for the Dressage Rider) to come to our barn for morning mat work and afternoon mounted sessions, I jumped at the chance, even though previous forays into Pilates hadn’t been all that successful for me. However, with Janice’s step-by-step instructions, hands-on approach, and direct application to skills in the saddle, I discovered things about my body that have changed my life and my riding. We learned (and practiced! boy did we practice!) how to engage the lower abs, the middle abs, and the upper abs as we attempted to build our “powerhouse.” My mantra has become “knit the ribs” along with “armpits to waist.” And who can forget the new muscle she discovered in all of us, the “thuttock” (gluteals and upper hamstrings). Learning how to perform the classic Pilates “wrap the thighs” though, was my lightbulb moment. However, my biggest takeway was understanding the importance of one-on-one work with a qualified practitioner. Previously I was just going through the motions and setting myself up for injury by relying on books, videos, and teachers with less experience. There is truly no substitute for the eyes and hands of a master in the art. Tai chi is an internal Chinese martial art practiced both for its defense training and its health benefits. 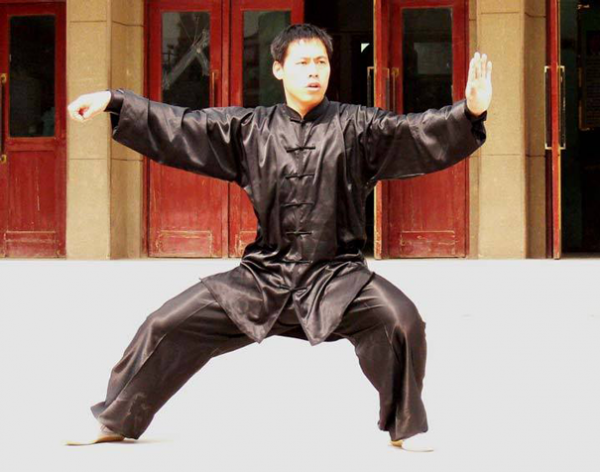 It is also typically practiced for a variety of other personal reasons: its hard and soft martial art technique, demonstration competitions, and longevity. As a result, a multitude of training forms exist, both traditional and modern, which correspond to those aims. 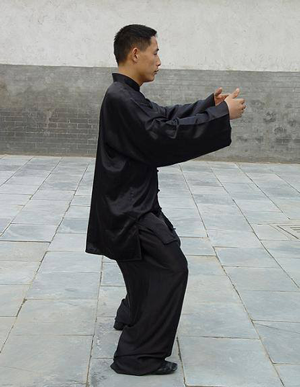 Most modern styles of tai chi trace their development to at least one of the five traditional schools: Chen, Yang, Wu (Hao), Wu, and Sun. The studio that I have found teaches the Chen style, which is the oldest, originating sometime in the late 1500s-early 1600s. While Grandmaster Chen Xiaoxing will be returning to Chicago in March 2014, with only eight lessons under my belt I’m not sure I’m ready for instruction from a personage of that level. 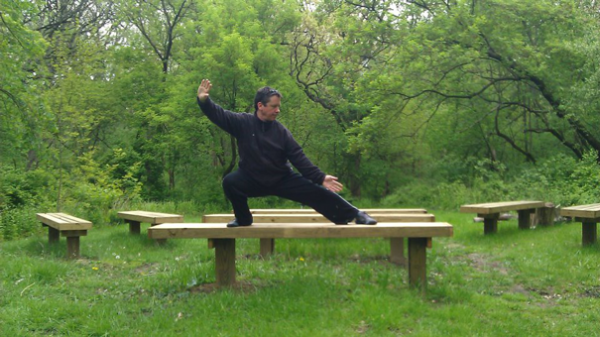 I’m quite content learning tai chi warm up exercises, standing meditation, Silk Reeling, and the Chen Style 19 Movement Form (with names like Buddhas warrior attendant pounds mortar, lazy about tying coat, and stepping by walking obliquely) from my local instructor. How Does Tai Chi Apply to Riding? What I find most fascinating about my tai chi practice (and I am fascinated by it) is how so many of the individual techniques and underlying concepts mirror those in riding. From horse stance (weight in the balls of the feet, arms softly raised as if hugging a tree, abdominal breathing) to weight shifting (staying centered, spiraling from the core not leaning, keeping balance), much of the subtle advice to improve or correct a posture or movement is advice I’ve heard from a riding coach or read in an equestrian magazine. Here’s an excellent example: this week after the usual standing meditation to calm the mind and prepare the body for practice, my instructor spent some one-on-one time with another student, describing and demonstrating how to raise the arms with the breath without creating tension in the neck or shoulders. He explained it as using just enough muscle effort to allow the arms to rise to just above waist height, visualizing that a string from the ceiling was attached to each arm causing them to lift. He specifically mentioned relaxing the shoulder, elbows, and wrists. Does any of this advice sound familiar? your head like a puppet. With your hand, pull straight up on some hair directly on top of your head between your ears. As you pull you will feel your face hanging perpendicular; the front of your neck will feel soft and the back of your neck will feel full (during each standing meditation, our tai chi instructor tells us to envision our bodies are suspended from a string from the ceiling attached to the top of our head). p. 46 As you make these tiny motions, pretend your head is a billiard ball and you are balancing it on the end of a pool cue (one of the warmup exercises in tai chi is neck rolls, in which we’re taught to pretend our head is a bowling ball on top our spine). What are the results of using forces of energy? I would love to hear what your fitness regimen includes, especially if it includes a unique discipline, one that you personally teach, or one that you feel has made a difference either in your riding or your personal life. Oh, what we do for our sport! The rider’s fitness is critical to the horse’s health. Having sustained a serious broken leg (tibial plateau fracture, 6 hours of surgery, multiple plates and pins, and 2.5 years to recover), my daily 5-6 mile runs had to be replaced. I can not run any more! Now my fitness includes physiotherapy sessions twice weekly, aerobics using a Nordic Track or recumbent bike, Sikaran Karate, and most recently, Colleen Kelly’s “Rider Biomechanics” (I very highly recommend this). Bottom line: a rider with a weak core is very hard on the horse.